I am calling this wall hanging "Age Old Lesson"... It all started with the middle block which was going to be used in a round robin quilt. However, the block measurements were off a little bit so I decided to turn it into a wall hanging instead. Then, as I thought about adding more applique to it I went to my library in search of one of my favorite books with Sunbonnet Sues. 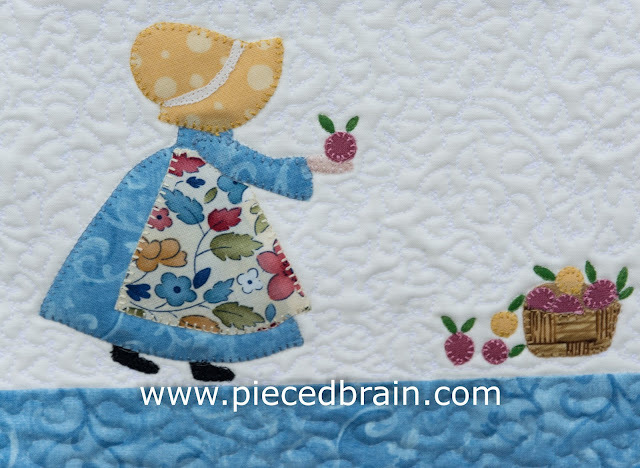 The book "Precious Sunbonnet Quilts" by Betty Alderman has beautiful designs for embroidery and applique quilts. I chose two of Betty's designs and had the most wonderful time figuring out the fabrics for their clothes and hats. The book, published by AQS (American Quilter's Society), features 11 projects which look great either as embroidery pieces or applique'. There is a softness to her Sunbonnet Sues which speak to my romantic side. Mixing traditional and new creations, Betty's book is a must-have for anyone who loves these girls. And so this project was born. On the top border the two sisters are tending the orchard and on the bottom border they are exchanging the fruits of their labor... 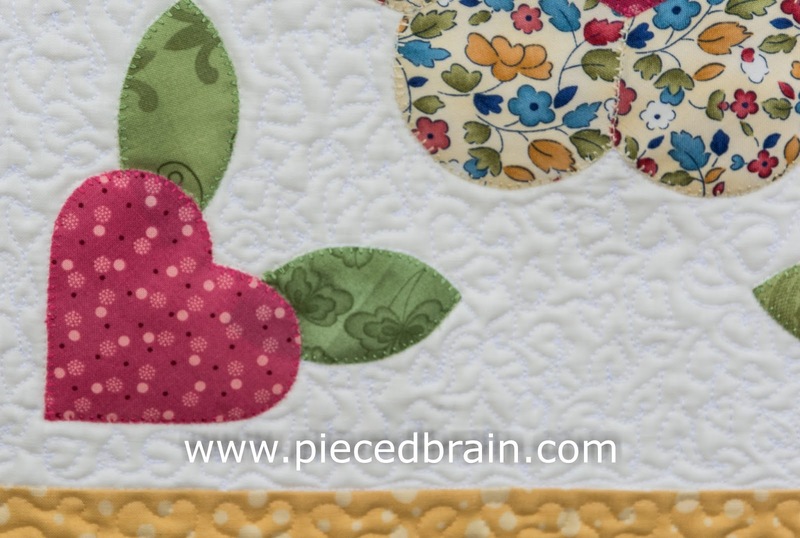 I quilted tiny hearts everywhere using Aurifil 50wt white because I needed a thread which would add to the softness of the theme without interfering with it. Perfect choice in my opinion! I fused all the shapes with HeatnBond Lite, including the tiny fruit. The leaves were added with fabric marker, and so were the trees. I am trying to decide if I should keep this one or if I should give it as a Christmas gift. It will be a tough decision... By the way, I am linking this post to Creating My Way to Success, and Sew Can Do on Monday, and to Crazy Mom Quilts and Confessions of a Fabric Addict on Friday. It is a gorgeous Fall day where I live in Utah today. I hope you are as inspired by all the colors around you as I am! What a lovely quilt. I always enjoy reading about the process others use in making their quilts. Thank you for sharing it with us. I love the second picture! I am enjoying your quilts. Thank you! Oh! This is so very sweet! 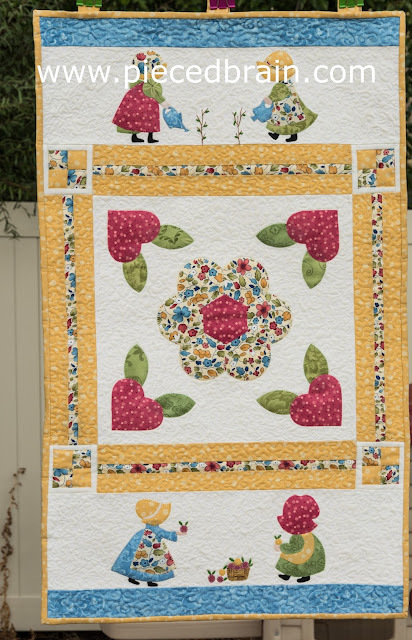 I don't care how old-fashioned they are, Sunbonnet Sues are wonderful. Oh my... that one would be a difficult one to giveaway. You've done a wonderful job on it. The little Sunbonnet Sues are adorable. I love fabrics you chose for their clothes!